China is widening their lead in AI globally by concentrating on a core set of best practices that energize entire industries to pilot and adopt AI for unique use cases. Thanks to its thriving start-up landscape, the United States is in second place when ranked by share of active players. Launched in 2017, China’s New Generation Artificial Intelligence Development Plan is delivering strong results and has become a topic of national pride. BCG finds AI’s influence on key industries is moving faster than many countries’ ability to structure governance and growth frameworks around. The Boston Consulting Group’s study Mind the (AI) Gap: Leadership Makes the Difference published earlier this month provides insights into China’s emerging global leadership of AI. A copy of the study can be downloaded here (PDF, 20 pp., no opt-in). BCG’s study focuses on the key drivers of success in AI implementations and is based on a global survey of over 2,700 managers in seven countries. Please see page 4 of the study for additional details regarding the methodology. The study found that there is a strong connection between bold, disruption-friendly management styles including actively putting AI high on the agenda, encouraging rapid development and piloting, and fostering cross-functional, agile R&D, all leading to AI industry leadership. Chinese organizations are beginning to dominate AI due to these factors combined with their shorter innovation cycles than their peer organizations. BCG found that structural improvements at the national level do play an important role in laying the foundations for AI growth—investments in data infrastructure, in research hubs and networks, and higher education for IT and data-related fields. 85% of Chinese companies are active players in the field of AI, leading all seven nations in the study. BCG defines active players as those companies making tangible progress in unlocking the value of AI in two dimensions: They are already moving to adopt AI into some existing processes or currently running pilot initiatives, and their efforts thus far have generally been successful. China’s dominance can be attributed to their New Generation Artificial Intelligence Development Plan introduced in 2017, which is delivering strong results. China’s AI dominance reaches across multiple industries compared to the majority of nations only concentrating on a few. 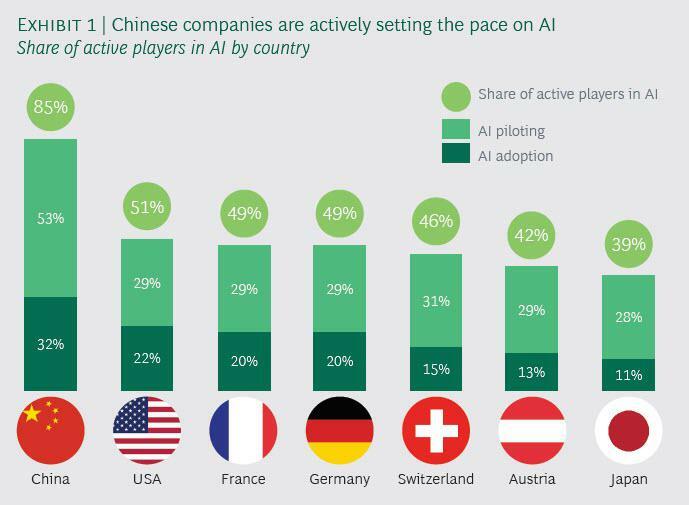 BCG interviewed 500 Chinese companies and found that the impact of their 2017 New Generation Artificial Intelligence Development Plan is having a successful cross-industry impact on AI piloting, adoption and success with AI initiatives. Unlike in the U.S. and other nations, China’s overall lead in the race to extract value from AI is not driven by the strong dominance of one or two particular industries; it’s succeeding as a nation and the industry-wide phenomenon that is rooted in how Chinese managers approach AI innovation. AI pilot and adoption success is more dependent on a company’s unique strengths and matters more than industry characteristics. BCG found industry landscapes heterogeneous in their relative levels of success with AI pilots, adoption and long-term success. Success with AI has a lot more to do with the technical infrastructure, available skills, execution speed and responsiveness, and support from senior management in individual companies. This finding explains why start-ups in the U.S. are the majority of active players in AI. They typically have small engineering and R & D teams comprised of highly skilled and talented technical professionals and can move much faster than their larger competitors. BCG also found industrial engineered product companies are strong, active players in Germany (with an 84% share) but weak in France. Conversely, data-rich consumer retail companies are much stronger active players in France than in Germany. Thanks to its thriving start-up landscape, The United States is in second place when ranked by share of active players. Underscoring just how crucial it is to provide startups with investment tax incentives in new technologies, the United States is in second place currently mainly due to the high levels of AI activity in digital start-ups. 76% of U.S. companies are active players and report a past implementation success rate of over 90%. Outside the start-up ecosystem, AI adoption and success rates are more mixed. The strategies and practices that enabled Germany and other powerhouse nations to lead previous technological innovations are preventing them from quickly capitalizing on AI. BCG found that changes that AI can unlock are disruptive, changing the way entire processes work and the roles humans play in them, and so the approach to corporate innovation must be disruptive, too. A meticulous focus on R&D and its organization into functional silos, and a risk-averse approach to change are holding nations back from accelerating AI strategies. Even with the right infrastructure, data, and skills are in place, these impediments slow AI progress across industries.